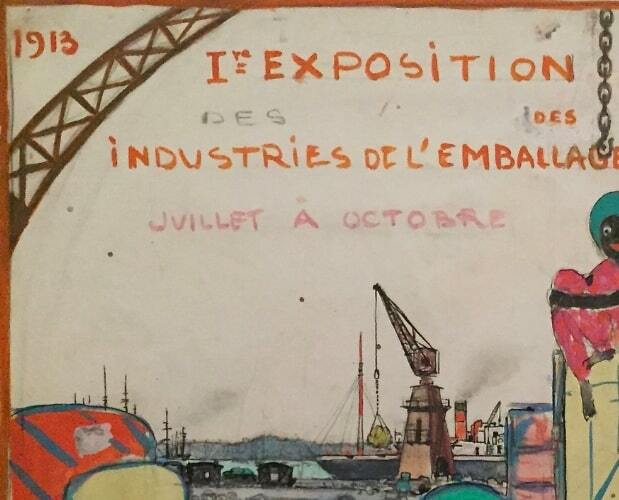 Georges LEPAPEOriginal design for the poster of the first "Exposition internationale des industries de l'emballage & de leurs annexes. Grand-Palais des Champs-Elysées, juillet-octobre 1913". Gouache on paper, 345 x 232 mm, estate stamp of the artist, mounted on cardboard in passe-partout. 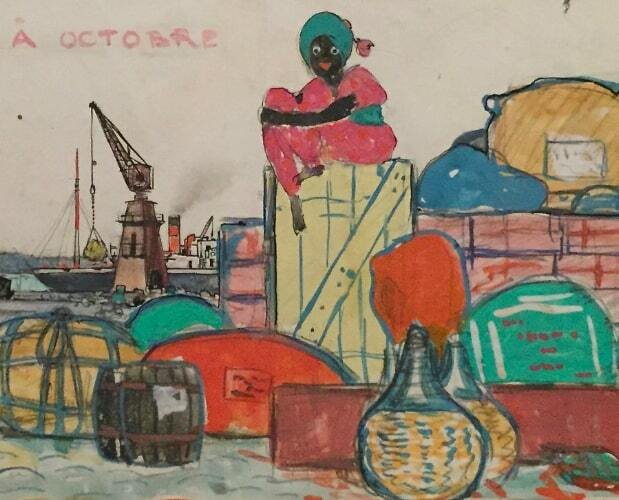 An African in pink and green is sitting atop a large pile of yellow and red crates, surrounded by green, blue, yellow and orange containers. 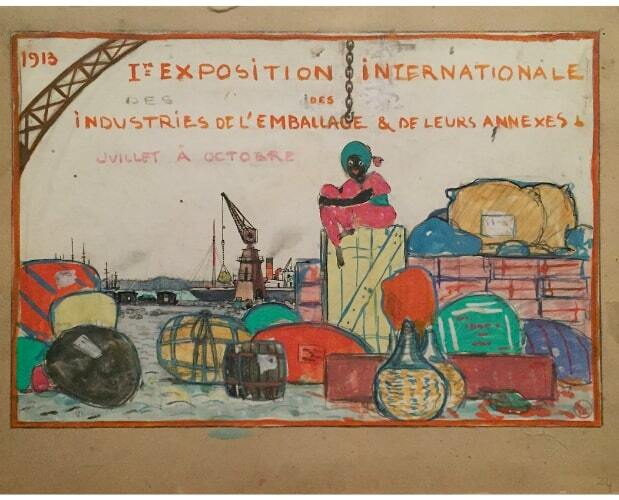 Promoting an exposition of refridgeration, packaging and related industries, the artist depicts a colourful cornucopia of produces and products unloaded off a ship and waiting for distribution by train. Fine poster work by the great Art Deco artist. Georges Lepape (1887-1981), one of the greatest Art Deco illustrators. Georges Lepape’s formal education began at the ateliers of Humbert and Cormon and continued at the Ecole Nationale des Beaux Arts in Paris. He gained attention as a young man with his work as a posterist and advertising artist and by 1906 was already experimenting with monotypes and etchings. However, it was his meeting with the fashion designer, Paul Poiret that really made Lepape’s name famous. In 1910 he collaborated with Poiret to create the deluxe fashion album «Les Choses de Paul Poiret », where Lepape caused a sensation in both the fashion and artistic worlds with his use of Art Deco simplicity and geometry well before the style was established. Lepape went on to become a major figure in Art Deco illustration and decoration. He expanded from fashion into the theatre and ballet where he designed everything from sets and costumes to programs and advertising graphics. His illustrations for Diaghilev’s Ballets Russes inspired a new, more exotic, look for women, typically wearing a turban and with large but evasive eyes. His poster of the actress Spinelly in 1914 caused more excitement and imitation, as it was the first time a face was illustrated in close-up. Lepape’s reputation allowed him many opportunities to work in collaboration with some of the great writers of the time including Henri de Regnier, Colette, Cocteau, and Pierre Louys. His etchings and pochoirs were also published in the leading Parisian periodicals such as the Gazette du Bon Ton and the Journal des Dames et des Modes. He was even invited to participate in the decoration of the great ocean liner Normandie. From the 1920s to 1950s Lepape was a regular contributor to Harper’s Bazaar, Femina, House and Garden, L’Illustration, Lu and Vu, and created countless covers for Vogue (Georgina Kelman).